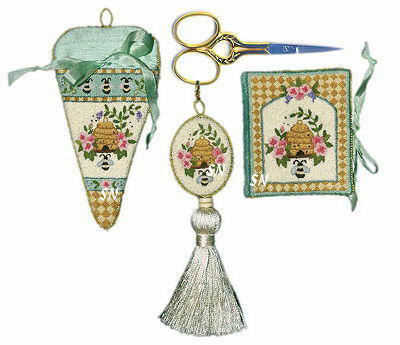 New from Teresa Layman Designs, this is an EXQUISITE set of miniature knotted rugs... perfect for a dollhouse, or even better -- framed and hanging with your favorite finished pieces!!! 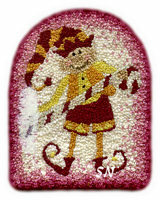 Joining our needlework industry, Teresa has been designing in the miniatures field for a few years -- and now we've discovered her!!! 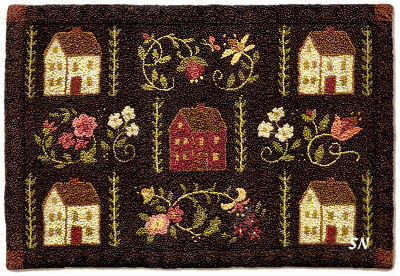 These tiny rugs -- 'My Cottage' measures a mere 3-1/8 x 2-1/4 -- are simply French and Colonial Knots with one strand of floss on sturdy muslin -- like weaver's cloth! 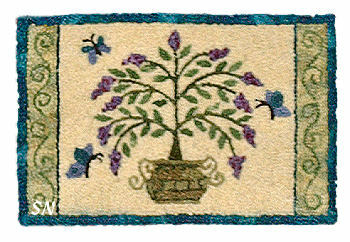 The design is presented just like Punch Needle -- stamped onto the ground fabric. 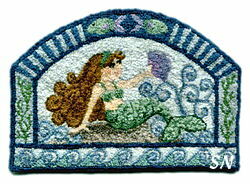 You stretch it tight in the hoop -- just like Punch Needle -- only this time work on the front of the piece! I've never been a fan of French Knots... but Colonials are a breeze... and we got to try it out at Market! You have the option of packing your knots in really tightly... or relaxing a bit... whichever you want! 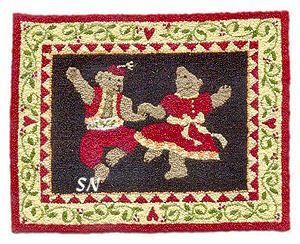 Our models feature approx 1000 knots per square inch worked in Colonials, and 2000 per sq in worked in French Knots! Teresa promises stitching time per square inch runs between 3 and 6 hours, depending on which knots you use. So... 'My Cottage,' for instance, should take approx 22 to 40 hours. Offered as the design stamped onto the fabric, the needle is included, as well as complete instructions... written in the order of areas you stitch first. I cannot possibly describe to you with my words, how beautiful and charming these are. They have enchanted me... and I want EVERYBODY to have at least one to love and enjoy for years and years to come!!! I'm knot happy! It's knot fun! I'm knot interested. Knot again! Knot your average stitch. Knot till the cows come home. I'm knot serious. I'm knot inspired. Knot until pigs fly. I'm knot impressed. Knot today! Knot till tomorrow. Knot necessarily. Knot a lot. knot tonight. Believe it or knot! Reminds me of my little Buster Brown -- the white Westie!!! Charming garden scene... you can just imagine his little nose sniffing all the spring air... and noticing that interesting butterfly! *What is he going to do?????? * Finishes approx 3 x 4. 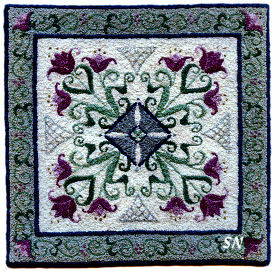 Teresa Layman has three new miniature knotwork designs... not Cross Stitch at all... these are ONE wrap of a French Knot with ONE strand of DMC floss. They are kind of like *paint-by-number* or punch needle, because the design is a line printing on fabric, and you fill in the color! 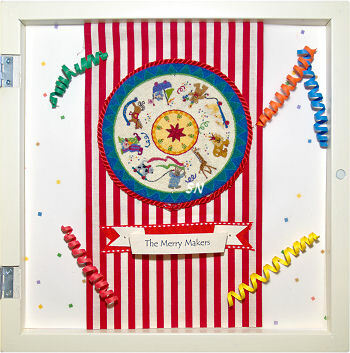 You need a good sturdy hoop, and a love of French Knots, and you're good to go! 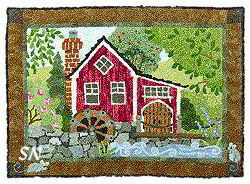 We have dozens of models in the shop.. and we did have a class in this one summer... and several did survive to stitch these charming creations! 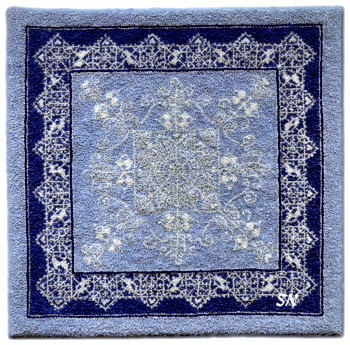 Presented as the design pre-printed on Teresa's Knotwork cloth and a couple of needles. You'll need a hoop and the DMC floss. 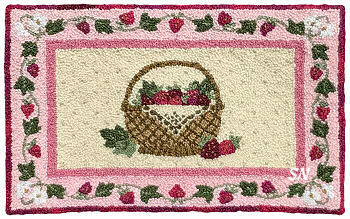 Winsome Ways finishes 5 x 5, Peacock finishes 6 x 2, and Strawberry Basket measures in at 3-1/2 x 5! A trio of fat little houses living made from the mosses of the forest, all the lights are on, so it looks like everyone is home this evening! Just a skinny thing at 2-1/8 x 5-3/8... it needs to be finished as a little stand-up brick to perch slightly hidden on a bookshelf or windowsill. Stately Saltbox Colonials... everything is surrounded by 4 sections of lavish vines of flowers -- each one of those is different. Beautiful browns, creams and cinnamon reds, this finishes approx 3-1/2 x 5. This needs a grand frame so it can hang on your wall -- rather than a brick stand-up or doll house rug. This one needs to be framed. A lovely little 4 x 4 piece, this features DMC colors in the 500 color family , as well as 924's and 3041's. 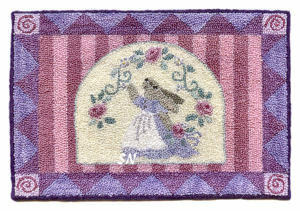 A pretty offering for a doll house rug, it's full of soft greens and sugarplum violet colors. What a cool nautical-themed piece this is! 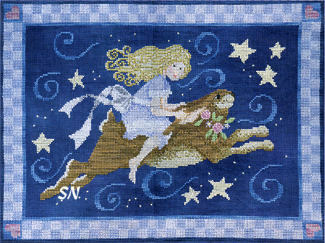 Finishing a mere 2 x 5, it features lovely blues, a neat compass motif and that awesome man-in-the-moon!!! Presented as the line drawing on a cut of weaver's cloth, you'll use one stand of regular DMC floss for your tiny knots. Teresa Layman is a lace collector... so it stands to reason that she would create a lace pattern in knotwork! This 5 x 5 doily is NOT a framed piece of lace -- it is entirely french knots of one wrap worked with regular, normal DMC floss!!! Lovely shades of blues to white... it is just so elegant! Presented as the line drawing on a cut of weaver's cloth, you'll need a 7-inch locking hoop to work this. 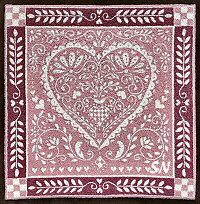 Ok all you miniature Knotwork Fans... Teresa Layman has two new designs to tempt you! NOT Cross Stitch... these are line drawings on special weaver's-like cloth that you fill in with solid French Knots of one strand of DMC floss! Not for the weak-of-knotter... if you've mastered her technique, these are actually very fun to work! You can be a nimble-knotter and do lots of knots per square inch... or not-so-neurotic, and just fill in the areas till they look full to your eye. Kind of like painting-by-number, Teresa's designs are CHARMIMG! Aren't they the cutest midnight trio? 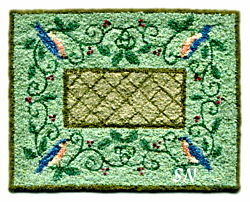 Finishing approx 2-1/2 x 3-1/2, this is a good basic design to choose as a beginning piece -- there are larger areas on one color in here. Look at the difference in this one compared to Merry Makers, for instance. Less color change, less hassle. How can you pass these little guys up? Little Mousie (way on top! ), chicken, goat, piggy, sheep and cow... isn't this great? I see it framed with a checkered mat treatment, hanging on a kitchen wall. Finishing approx 2-1/2 x 5 -- just such a quintessential farm-flavor! 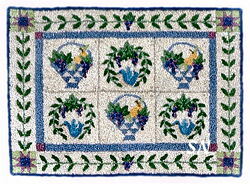 Finishes approx 5-1/4 inches square, 4 charming flower garden borders -- these would really be pretty with a touch of hand-dyed floss in the flowers. You probably can't see the center detail, but it features 16 squares with the palest dots in it... nothing too dramatic to take away from all those pretty flowers. 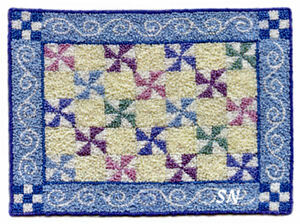 A classic quilt design, there are only 9 colors of DMC in here, blues, pinks and purples. 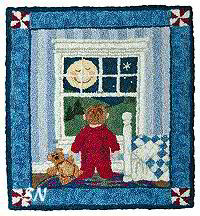 A companion in size and subject to Teresa's other quilt-inspired designs, this one finishes approx 3-5/8 x 2-3/4. Would this be referring to all the tea currently residing in the country of China or the tea in the precious cups made of china that you'll be knotting??? 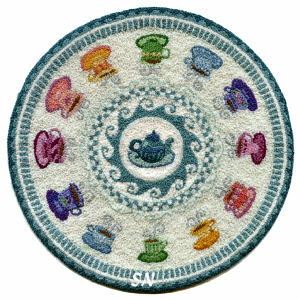 Finishing approx 4-1/4 inches in diameter, every teeny tea cup is different, and beautifully organized amidst round borders of scallops, stripes, swirls, checkerboards and waves! I'd definitely frame this one for kitchen wall -- no tea cup sitting on this!!! This one is a little more involved. 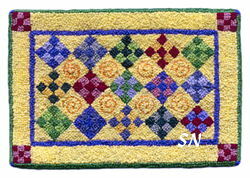 Still the same knots, still the same one strand of DMC, there is just more detail in this 5-1/8 x 6-7/8 inch piece, which is about twice the size of most of Teresa's other things! The design is stunningly gorgeous, all those little diamonds -- 1/2 an inch by an inch -- each have a tiny rose or leaf design in them. 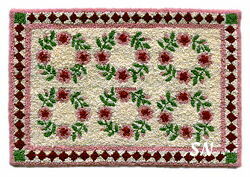 The border design is so delicate that you'll have single knots decorating the centers of the roses. NOT FOR A BEGINNING KNOTTER... choose Pinwheels instead!!! 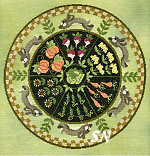 Teresa Layman has two new miniature knot work patterns -- Chocolate is my favorite! 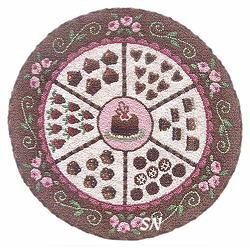 Line patterns that you fill in with tiny French Knots -- just like painting by number -- Chocolate makes a 4-1/4 inch round doll house rug or small doily sit about -- just like some of Teresa's other garden rounds. All the tiny deserts and candies in this are simply charming! 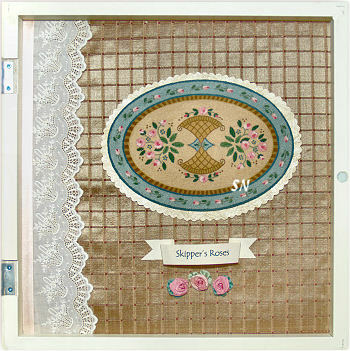 Happily Ever After is a sweet piece -- 4-3/4 x 3-1/4 that would be cute in a small girl's bedroom. 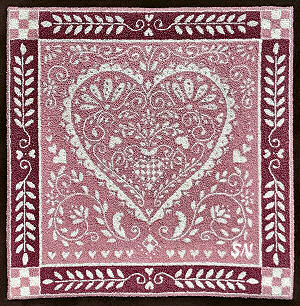 Both patterns are offered as the pre-printed line design on Knotwork cloth, along with two tiny needles. Calling for regular DMC floss... after hosting Teresa here last summer... these don't scare us anymore, and they're FUN to Knot! It's Santa getting his reindeer ready for the Big Night! 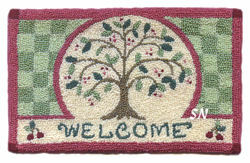 The striking border of evergreens is a delight to knot because of all the solid areas and simple colors. It's just lots of filling in, which goes very fast! 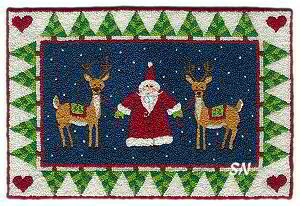 I love the bright colors against the dark navy background, and that chubby little Santa guy. Measuring just 3 x 6, you can see antler and rein detail, even the tiny flowers on the deer blankets! Offered as the design stamped onto the Knotwork cloth, needles are included but you'll need 15 colors of DMC from your stash, and a tight hoop. Fat Bunnies dreaming of those waiting carrots! 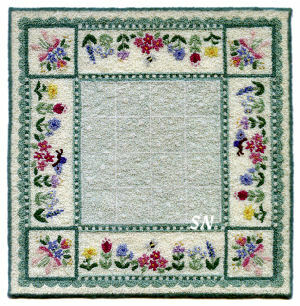 Such a Springtime feel to this 3-1/2 inch square rug, this is another one that will be easy to knot. 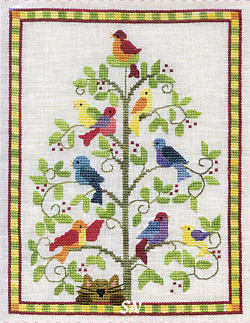 The leaves are all little solid areas, and the border is super simple... too cute for words! Needs 11 colors of DMC floss and your Knotting Fingers! Rich greens and bright carrot oranges against that brown (3371) background. The first 5 of Teresa's Elves... the next 5 are still available only in Knotwork... so these 5 darlings will have to do! Stitch them all together, or separate... you get Cocoa Chanelf, Milton Cookies, Peppermint Twister, Rosie the Ribboner, and Twinkle Toes. Charted for DMC flosses. 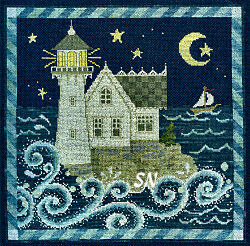 I love the colors in this, the roiling waves, and the gingerbread detail on the lighthouse. 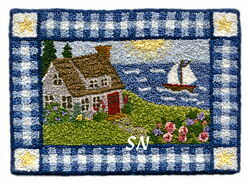 Offered as the chart, this finishes approx 11-1/2 inches square on 32ct. Quite commanding! Check out those little mice! Finishes approx 10 x 13 on 32ct. 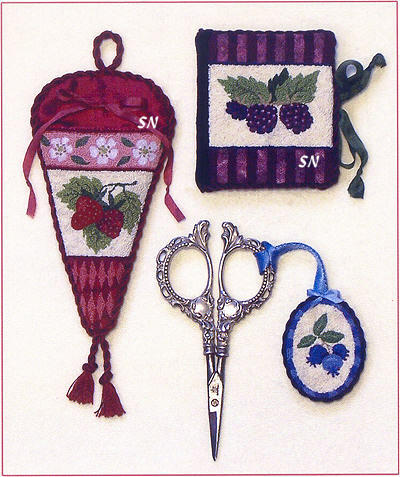 This is a trio of miniature knotwork pieces -- the scissor case, fob and needlecase -- all with different but coordinating berries stitched with perfection. Worked with both DMC and overdyed flosses, the chart contains acid-free paperboards and flannels along with assembly instructions to create this trio of charming tools. The berry colors are deep and rich... just very different and really an eye-catching collection! Packet contains the pre-printed fabrics, needles, cardboard forms, flannel for needlebook pages, and all the necessary color keys and construction guides. Looks good enough to eat! Presenting 4 New Miniature Knotworks! 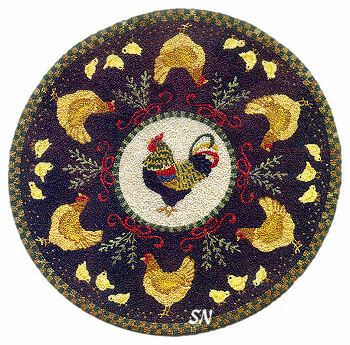 Zack's Garden and Pecking Order are only two of Teresa's newest Knotwork designs -- 3 x 4 and 5-inches round -- these are exquisite creations of French Knots done with one strand of DMC floss. KNOT to be blown off as too hard... you actually CAN do these! Teresa returns to Silver Needle in July of 2011 for a two-day workshop in knots and laces. We love her things... tiny works of art! Click the pic to see the rest of the new offerings! 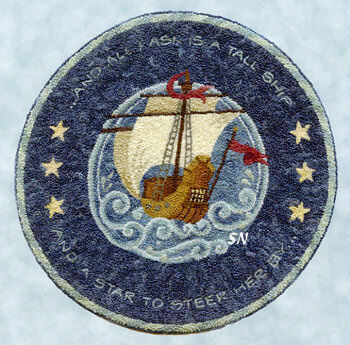 Finishes approx 5-1/4 in diameter, AWESOME detail and classic color. I want it for my kitchen!!! 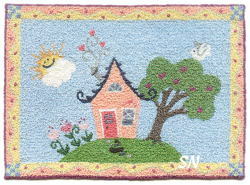 Traditional doll house rug... this measures approx 3 x 4. Yellows and blues... very Country French in feel... kind of like a Woad Dye! (that classic French country blue dyed fabric.) Just charming! Well... just a perky little fish, full of personality... ready to be knotted to perfection! This little guy has been busy as Teresa's beginning class design... and now, he's finally made the 'big time' by joining her full line of designs! If you like Mr Fishy, check out Wild Salmon!!! 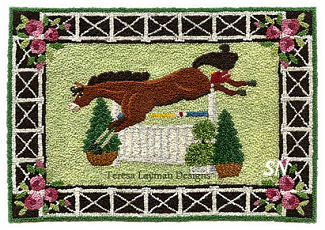 More Teresa Layman in Cross Stitch!!! Our favorite 'Knotty Gal' Teresa Layman is beginning to convert some of her miniature knotted rug designs into Cross Stitch, via leaflets!!! We are *SO EXCITED*... because her first 6 are HERE! Beautifully presented with a huge color pic on the front, she's chosen really good symbols -- to create contrast in the actual chart. No looking at one of these and seeing nothing but symbols in all the same faded value. You can 'See the Design' in the chart! Charted predominantly with DMC flosses, there are a few hand-dyed tossed in here and there! 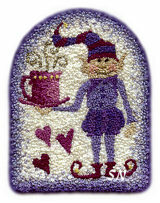 What treats to stitch, click to see them all, and choose the one you want to do first! 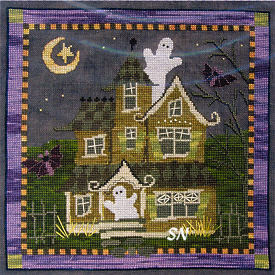 I love the crooked lines in the windows, the purple bats, and the charming checkerboard borders and roof. The chart is beautifully done, very easy to read. I want to live here! 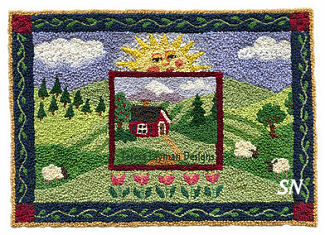 Charted for DMC floss, this finishes approx 7 x 9-1/2 on 32ct. Fabric choice determines the final size... so anything goes! Pretty, pretty colors, just a charming scene. The same whimsical rabbit carrying his girl to her sweet dreams! Stitched with DMC cottons and Weeks overdyeds, this one is rather large if you work it over two on 32ct... 10 x 13! This is stunning... and so is the chart! Regular DMC flosses... all the little rabbits are running around their delicious garden of radishes, pumpkins, sunflowers, peas, carrots and dill. This has always been one of the most popular designs in Teresa's Knot Work collection... so I can't wait to get our shop model stitched! This one is large... over two on 32ct, it measures an impressive 14-12 inches in diameter!!!!! 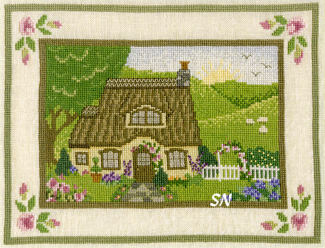 One of my personal favorites... just like that English Cottage... I want to live HERE, too! Stitched with DMC flosses... you probably could use a bit of hand-dyed in the water and grass if you have a pale shade on hand. Finishes approx 6 x 8, over two on 32ct. So charming! Full of birds and full of bright color... the little kitty at the bottom looks on with patience! 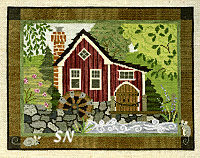 Stitched with DMC and Gentle Art Sampler Threads, this finishes approx 5-1/2 x 7-1/2 on 32 over 2. Bright and cheerful! Teresa's newest set of 5 -- we now have 10 little guys all 'busy' getting ready for the 'Busy Season!!!' 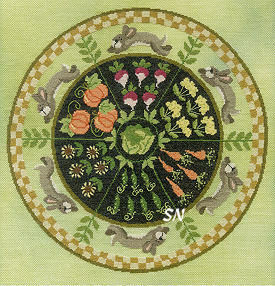 All are knotwork, all finish approx 2-7/8 inches in diameter... and all coordinate with last year's set of cuties! MAKE SURE YOU PAY ATTENTION to all their names!!! Finishes approx 4-1/2 inches in diameter, so much movement in the design... very classy! Teresa has her newest pieces presented in shadow-box frames that you can find at Michaels ($10-ish) or Pottery Barn ($35-ish)! They feature magnetic closures, and some have easel backs as well as hanging loops. These are a great way to do a little 'scrapbooking' to create a background for your little rug -- kind of showcases it -- and WOW... what a miniature showcase you've created!!! 3-5/8 x 3-5/8, The waves are *wild! * Stunning colors, I'd love to live here!!! 2-1/8 x 3, This is charming!!!!! How can a little pig playing with the hose be this cute? 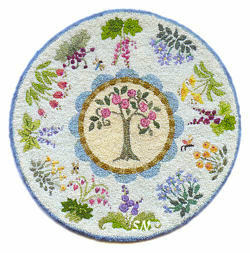 4-7/8 Inches in diameter... intricate details, pretty colors... just precious! 4-1/4 x 6, this is the largest of Teresa's pieces. 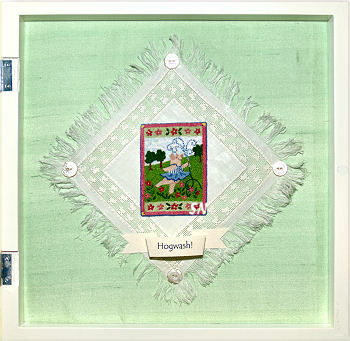 A lovely doll house rug, the shadow box presentation saves all the hard work of constructing the doll house!!! 4-1/8 x 2-3/4, check out the little ladybugs! 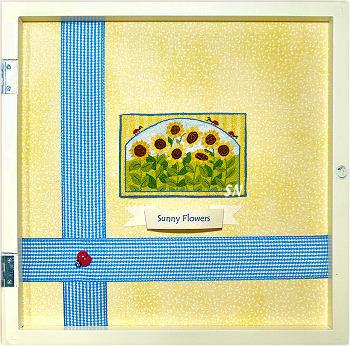 I love all the yellows and greens in this, notice some sunflowers have checkered middles and some have swirls? Here's a switch in Teresa's Style! Awesome, bright colors, this set is knotted in Colonials rather than French Knots, so they're bigger, and it goes faster! Package includes the designs, handmade clay bead for the fob, acid-free boards for the forms, flannel for the needlebook pages, lobster claw clasp, and all the assembly details. Scissors are not included... but we carry 4 great colors of those! 5 Miniature eggs... actually they really are about life-sized!!! Each finishes approx 2-1/4 x 3... just lovely, especially nestled in their paper grass! 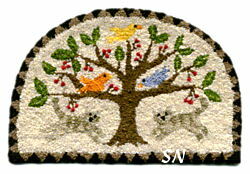 Finishes approx 3-1/4 x 3-1/4, Acorns, strawberries, ladybugs and that lovely, flowing tree, the colors in this are so vibrant! I LOVE this one! 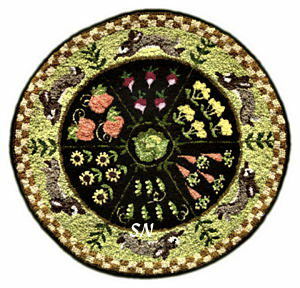 4-1/8 in diameter, it's filled with delicate perennials and gorgeous color. 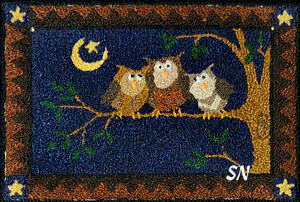 Easier pattern -- better for a beginner because the design is simpler, this finishes approx 2 x 3, and uses only 7 colors. 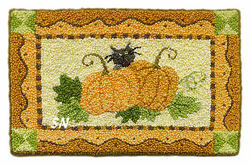 Crisp oranges, cinnamons and that cute little kitty in black... 2 x 3, this is another really good beginning piece. Whew, not as easy for the beginner! 3-1/4 Square, this is darling!!! Frame it in a metallic orange and purple setting, you could even add a bit of metallic to the background stars and sky! 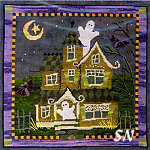 Do the ghosts in opalescent or glow-in-the-dark thread! 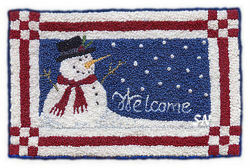 A sweet little snowman scene, this finishes approx 2 x 3 and BEGS for a little opalescent in there! So delicate... might be a great piece for a beginner, because you have all those solid background areas, and bits of floral detail. Very ice-creamy! 2-5/8 x 4! Packages include the pendant hardware!!! 1st Question answered! Only 1-1/4 inches in size, so they are GREAT beginner pieces!!! 2nd Question answered! Teresa's words of advice tell us NOT to begin with your very favorite design first, because you're just learning... and the first piece won't be your best. 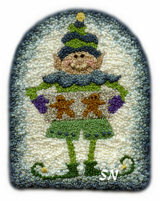 One of Teresa Layman's newest releases, this miniature gingerbread rug is exquisite!!!!! 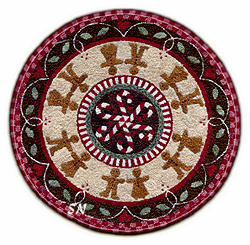 Your 5-inch circle of French and Colonial Knots is worked in gingerbread brown flosses, with accents of cream, black and reds. Stunning detail, such a graceful and flowing design... it's so classy! We've seen these pieces custom framed in such elegant presentations, they're too pretty just to leave out on a shelf to collect dust! Offered as the design stamped onto the ground fabric, ready for your tiny knots! 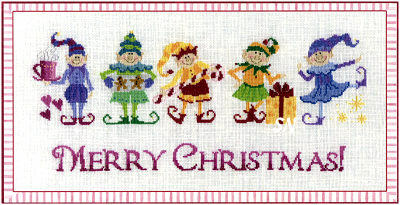 This is a charming family of 5 elves... all knotted in different colors... but all the same shape and size. Each is a special Christmas Character... and I just love their names! Milton Cookies, Rosie the Ribboner, Twinkle Toes, Cocoa Chanelf, and Peppermint Twister. 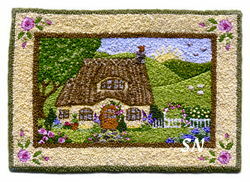 Studies in shading, all are created with your tiny French Knots done with one strand of floss. 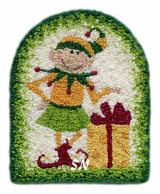 Offered as the line drawing on the base fabric, each finishes approx 1-1/2 x 2 inches -- a great ornament size. Their faces are sweet, costumes are delightful, their whole demeanor is one of Holiday Cheer! 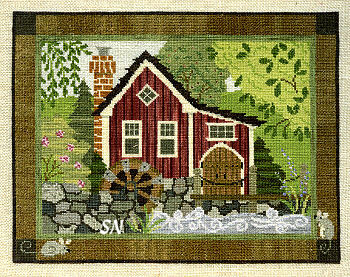 Lush greens, barn reds, a peaceful scene. Check out the tiny mice hiding in the border!!! Measures approx 4-1/2 x 3-1/4. Oh... I love scenes like this one! 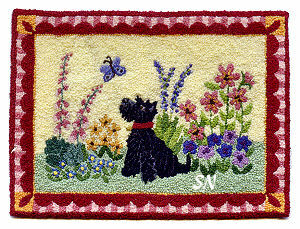 It's a Happy Everything kind of thing... this finishes approx 3-5/8 x 3-7/8. 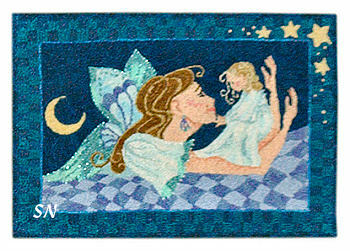 This, along with Fairy Godmother, would make a precious birth sampler! Full of colorful birds, with songs just as colorful... do you see the kitty-in-waiting??? Shown finished two completely different ways... click the image to see both. Finishes approx 3-1/4 x 4. Oh my gosh... watch the kitty... stalking the mice in the center of the garden! Hiding in amidst the flowers, ready to dash down the cobblestone garden path... those merry mice have no clue what awaits them! Teresa Layman's unbelievably small, perfect little knots create the most beautiful miniature creations... and this is no exception! 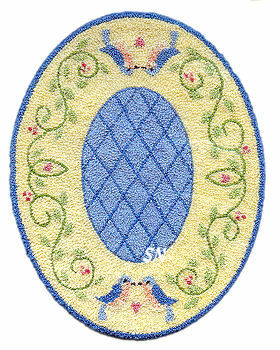 Offered as the line drawing stamped onto the base fabric, simply 'paint by number' by filling in areas with French Knots, using one strand of floss. 'Impossible' you say... let her DVD tell you otherwise!!! 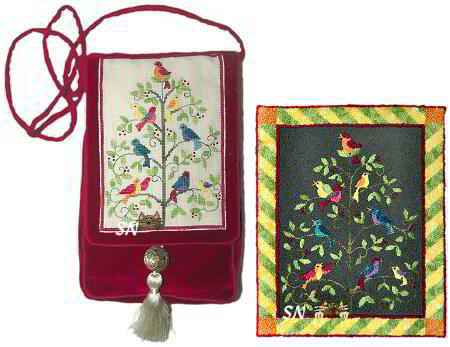 Needlework accessories worked with Colonial and French Knots... this is a charming set that's done with the same technique her miniature knotted rugs are... but finished into a special set of stitching cases!!! A pastel garden of flowers surrounds this busy beehive... and I love that yellow and butterscotch checkered border that sets it all off!!! Three coordinating pieces, each of the stitched pieces is offered stamped onto the heavy ground muslin. Complete instructions are provided for 'knotting' and finishing everything... but I'm guessing this is for a bit of an advanced stitcher and seamstress -- (I can knot, but I can't sew, so I'll send mine out for finishing!!!) The stitched areas feature knots done in one stand of floss, to create a soft looks that reminds you of miniature punch needle! 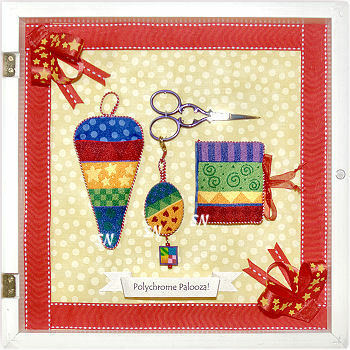 Your scissor case will finish approx 2-1/4 x 3-1/2, Needlebook will measure approx 2 x 2-1/2, and the fob is a 1-1/4 x 1/2 inch oval. Included in the package are the patterns stamped on the fabric, needles, acid-free boards for forms, ivory flannel for needlebook pages, lobster claw clasp for the fob, and instructions for everything! Absolutely exquisite... this will DEFINITELY become a treasured heirloom!!! 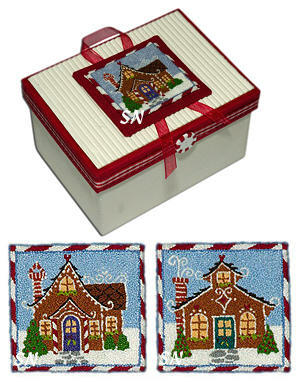 2 Pair of miniature gingerbread houses... each tiny abode knots up to a whopping 2-inches square!!! 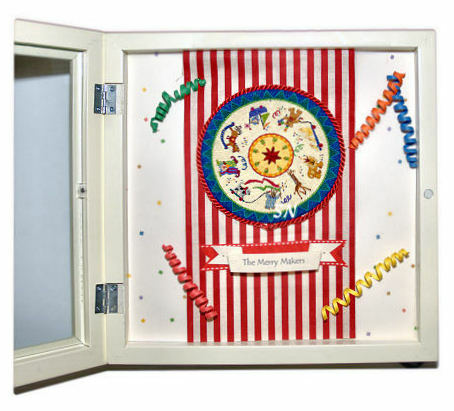 Our model pics are shown in Just Nan's Whimzi Frames (long gone now, sorry to say) -- enameled with a red trim, and embellished with darling clay pieces that seem to have come right from the tiny houses! (Note: Teresa used to create real Gingerbread Houses, and then write books about them. She has two published hard-back books with recipes and directions for several of her 'designer houses!') 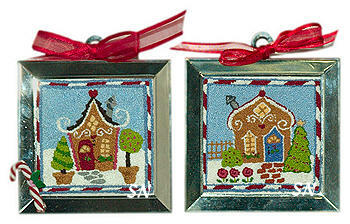 Anyway, you can knot four lovely little homes... too pretty to eat! 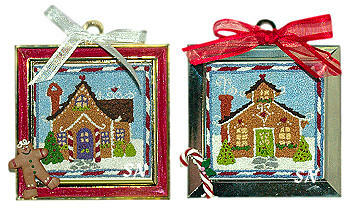 Perfect for your tree, or a small, special spot on the thin wall... the detail in these is exquisite! Offered as outlined drawings of the two houses in each pack. The new Whimzi frames are darling! Cherry-Red enamel, and that cute little gingerbread man or candy cane... I was just 'taken' with the fun frames! They're here now! 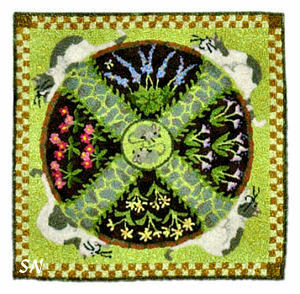 Finishing approx 3-1/8 x 2-1/16... the creams, lavenders and periwinkles, and soft greens in this piece are stunning. Very 'Country French' feeling to me, I see this in an elegant, chunky, oversized gold leaf frame... (hanging in a 2-story, marble floored foyer with an antique wrought-iron curved staircase... you pass an open leaded glass window that looks over the beach to the sea...) or OK... just somewhere small and special in your house!!! 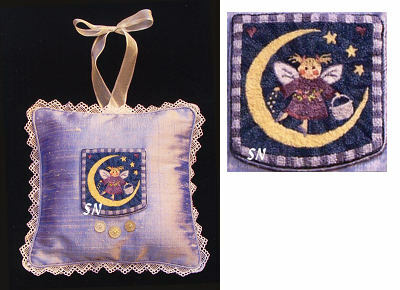 This is an exquisitely delicate tooth fairy pillow design that will be cherished for generations of your family to come! Your stitching is the 2-1/2 x 2-1/2 inch pocket on the silk pillow that holds the precious, required tooth. 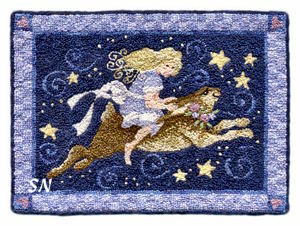 Stitched entirely in French and Colonial Knots, the design features the Tooth Fairy dancing on a sliver of a moon... sprinkling fairy dust. She's floating through the night, gathering those Precious Pearlies! A whimsical journey, something to delight the senses, something that inspires sweet dreams... what a beautiful piece for a special bedroom! 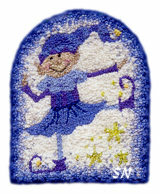 This is a delightful piece full of deep, rich navy and lavender, accented with golden stars. Finishes approx 3 x 4. Very European! What fun for an anniversary! Rich reds, soft browns, mossy greens, all with a black background. Finishes approx 4 x 3-1/8. 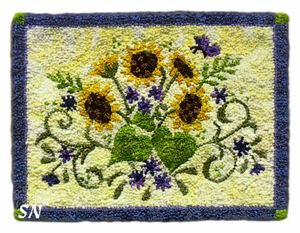 Bright sunflowers, rich summer violets, the overdyeds in this include Pineapple Sherbet, Spring Grass and Sugarplum! Finishes approx 3-1/4 x 2-1/2, petite and summery! I love this one! A pretty flower garden, complete with kitty and resident bird! 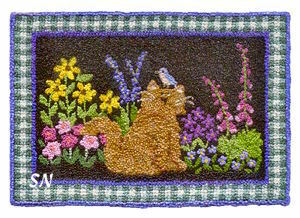 Finishing approx 3-5/8 x 2-1/2, the black background really sets off all the pretty flowers and the cat! Something for the Raggedy Ann and Andy Collectors... this is darling! Denims, creams and deep reds, this finishes approx 3-3/4 x 2-5/8, and has a really old-fashioned feel to it. Darling! 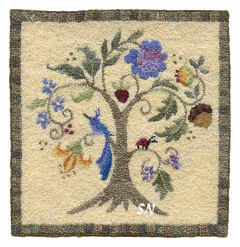 A new miniature knotted rug design by Teresa Layman has arrived! 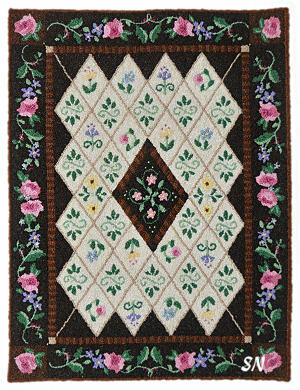 Designed as a companion piece to the Sweet Harmony set of needle case, scissor case and scissor fob, this features Colonial and French knots jam-packed into a tiny 2-1/4 x 5-1/4 rug! 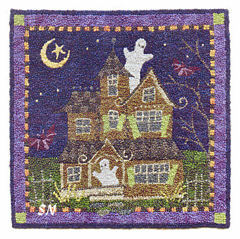 Worked in regular flosses, the design comes stamped on to the fabric -- just like Punch Needle - but you work it in all knots! Frame it, with or without that cool fringed edge, or make it for a doll house... it's just enchanting! The package includes the stamped design and instructions. You supply the DMC floss. Finishes approx 4-1/4 inches in diameter... the detail on this is incredible! Tiny pumpkins, peas, carrots... and those rabbits... this is CLASSIC, and one of my absolute favorites! Straight from a storybook in my imagination... how can one NOT be drawn to this one? Finishes approx 3-1/2 x 2-1/4. OH... give this to a knitter!!! 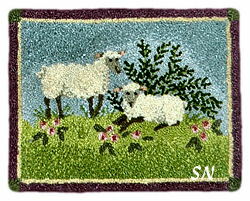 Precious lambs out on a sunny day... this one finishes approx 3-1/2 x 2-3/4. 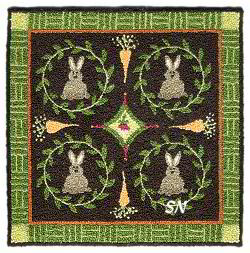 Robins framed in the DMC border of 502, 503 and 504... the taupe in the center is 642 and 644! Gorgeous! Finishes approx 3-1/2 x 2-3/4. This is darling! Change your kitty colors if need be... it finishes approx 3-3/4 x 2-1/2! Another one of my favorites -- can you tell! Nautical blues, charming seaside colors... I want to live here!!! Finishes approx 3-1/8 x 2-1/4. 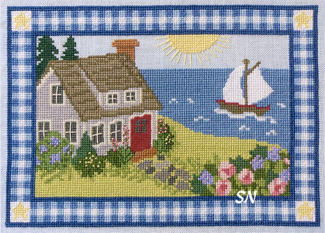 Aqua blue and charming... Cottage, this one, and Wild Salmon would make a neat grouping -- especially if you live near the water! 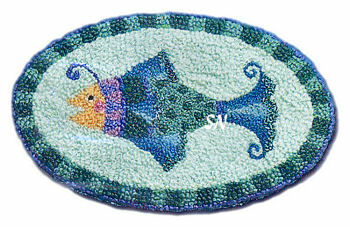 Fish Tale finishes approx 3-1/8 x 2-1/4. Here's a wild and crazy thing!!! 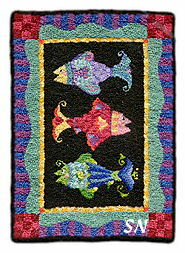 Bright, happy colors, cheerful, funky fish.. very 'artzy-fartzy', contemporary, and fun!!! Finishes approx 2-7/8 x 3-3/4. Two different little floral baskets... lots of periwinkle and lavender details in here... it's gorgeous! 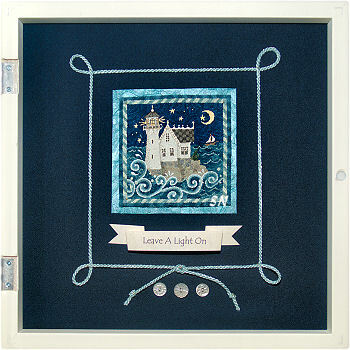 Finishes approx 4-3/8 x 3-1/8. Another quilt... check out the swirls in the middle yellow squares! Pretty colors on this one... finishes approx 3-1/2 x 2-1/4.